Let’s start with an overview of a few important concepts. 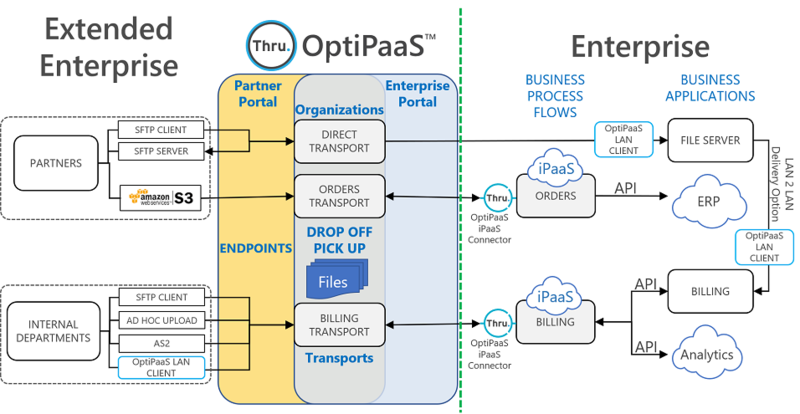 Thru’s OptiPaaS is a cloud based Managed File Transfer as a Service (MFTaaS) platform that enables enterprises and their partners to share files based on a postal service model. Both Enterprise and Partner organizations simply “Pickup” and or “Dropoff” files in OptiPaaS via a self-managed file exchange portal. Internal teams, business units or systems can also use flows to interact with one another’s end points with the ability to subscribe to file exchange “Transports”. Optionally, MuleSoft’s Anypoint Platform can be interfaced to OptiPaaS by connecting Mule flows to OptiPaaS Transports using Thru’s MFT Connector for MuleSoft. This powerful combination of industry leading file exchange and integration platform solutions, enables enterprises to “drag and drop” complex file exchange processes into an enterprise business ecosystem with ease. Once granted access by the Enterprise, Organizations self-manage their users and reusable End points. End points are used to subscribe to the Transports (file exchange processes) that the Enterprise has exposed to the Organization. The following sections are organized to provide a detailed understanding of these important components.